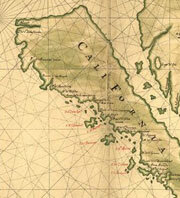 Map of California as an island, circa 1650. Desiree Cooper: Dr. Monmonier lets start simple. If GPS comes from satellites, how do these errors happen? Mark Monmonier: GPS can still be wrong because basically what we are often times doing is taking the coordinates we get from a GPS system and we are putting them on electronic map. And that electronic map might be based on paper maps. Those paper maps might be wrong and there is a possibility that we might have features that were put on the wrong place in paper maps that were otherwise right. So, consequently errors happen. Dr. Monmonier what, in your opinion, are the top three map-making mistakes, which you would consider the hugest blunders in map-making? I suppose we could go back in time and we could look for some early maps of the North American continent and they showed California as an island. This fiction persisted for well over 100 years. It even lasted for a while after a Jesuit missionary walked from somewhere in Arizona to the Pacific Ocean. Okay, so California as an island that would be a biggie. What's another? Back in the 1990s, when there was a war going on in Yugoslavia, NATO forces wanted to bomb a facility in Belgrade that was a supply headquarters for the Yugoslav army. And they had a street address. The only thing is they weren't exactly certain what building that street address represented. They had some aerial photos. They had some maps. Someone finally identified it as "this structure right there." It might have been a pretty good guess, but unfortunately that happened to be the Chinese Embassy. So, they were using inaccurate cartographic sources. This is really something you have to watch out for. Maps are items that have a shelf life. The surface of the Earth changes and if you are using old maps you're kind of going to have some problems. What would be your third largest blunder in mapping? The third one would relate to the incident that happened with Hurricane Katrina. In 1965, the U.S. Army Corp of Engineers was designing a flood wall and they figured out how high this wall should be based on the height of mean sea level in 1965. Then they put out specifications for this wall based on maps that had zero elevation back in 1929. And what happened between 1929 and 1965 is that the level of the land had dropped 1.5 feet So, they had a wall that was a 1.5 feet too short. Once, when I was applying for a government job, I used Mapquest to get directions to the hotel where the various rigorous government tests were to take place. As this was the government I was required to be hideously punctual. Unfortunately, as I was driving along the highway, I noticed the exit Mapquest had directed me to take. It was still in the process of being built. I took the next exit and tried my best, but needless to say, I was late and hence missed my chance to be injected, inspected, detected, infected, neglected and selected. Fortunately, as this was the government, all I had to do was go back again the next time the tests were offered.